Before I got pregnant, I remember feeling *so* strongly that I wanted to maintain my trim, size 4-6 body no matter what the cost. My highly ambitious self continued to workout through my pregnancy. That is, until the sciatic pain started. Sciatic pain led to shortness of breath led to hungrier appetites led to an extra 25 pounds passed what my doctor had recommended gaining. 1. I know my body did an INSANE thing - growing a tiny human inside me for almost a year, then feeding that baby from milk that my body produces...that is no small feat, friends. Recognizing that and changing my mindset to a spirit of gratefulness has made a very big difference in my outlook. 2. I bought clothes that actually fit me now. People always told me, "Your body will bounce back!" but my jeans tell me otherwise. Those babies aren't buttoning for a LONG time. And my cute tops? Those no longer work either due to my shoulders widening and my chest growing to about 3x its normal size. I NEEDED new clothes. But here's the thing - I'm BUSY. Being a new mom is a lot to adjust to, then add on transitioning back to work...then add on the life-altering task of breastfeeding. You guys - I have an entire post to share about how my life is divided into 3-hour increments but basically I have ZERO time in my day to do anything other than go to work, pump, eat and feed my baby. Shopping is out of the picture. So that's when I decided to order a DAILYLOOK box again. You might remember when I ordered a box from them as I was growing out of my old clothes mid-pregnancy in this post. I loved the service, the selection, and the brands so I decided to try it again! It was so great to get a variety of items (7-12) that I could try on at home, after work. It took so much stress out of trying to get out to shop, and also reduced the frustration of ordering items online that don't fit. My stylist nailed my box, adding a GORGEOUS cashmere sweater from 360 Cashmere, a bunch of lovely sweaters (I had requested sweaters since all the ones I owned prior were a size small), jeans, a few work trousers, and a couple tops. 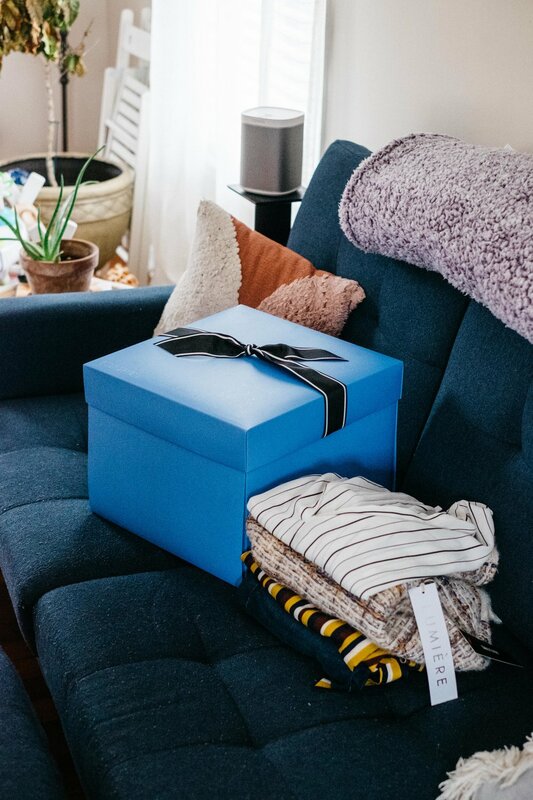 Everything from DAILYLOOK comes in a big blue box (that I ended up keeping and using for holiday storage because it is SO CUTE), with a sweet note about the items from the stylist, along with a pricing sheet so I don't have to fish around for price tags. I have a few days to try on the pieces, then I bag up the pieces I don't want to keep and send them back. In a time where there is so much overwhelm, it's really nice to sit back and have someone else do the shopping for you. If you're feeling uninspired, stressed out, or just need a little help picking some cute pieces, definitely check out DAILYLOOK. 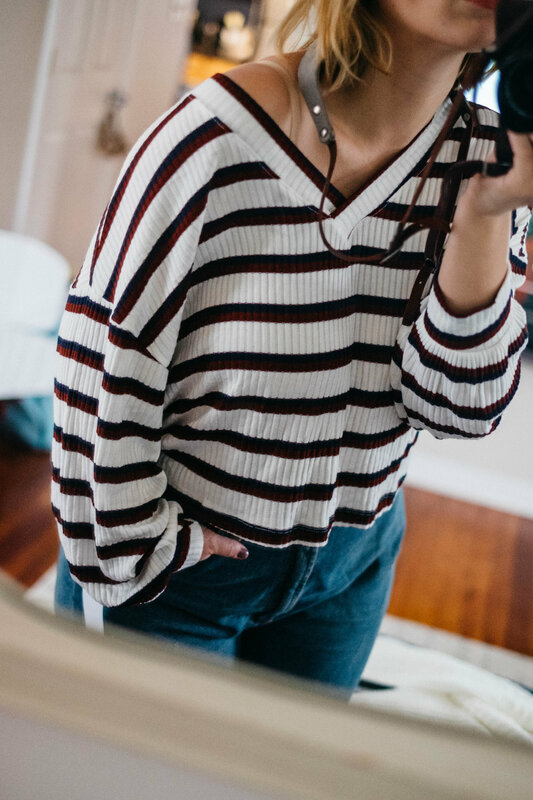 It sounds crazy, but something as small as finding clothes that fit my NOW body really made a difference in my confidence level, and maybe it can for you too. Use code JULIEN10 to get $10 off your first box! This post was sponsored by DAILYLOOK, and all opinions shared are my own. So I had in mind to share 5 gifts, but it’s so hard to narrow them down! So here are 6 lovely, thoughtful gifts for the sister, mother, friend or daughter in your life! Are guys not the HARDEST to buy for? This year, I’m sharing a curated list of hubby-approved gifts we actually have! I rented this teal Tibi pleated skirt on a whim with my Unlimited subscription, and it’s been one of my most worn rentals ever. It’s also been one of my most complimented items, which tells me people are very into pleated skirts right now. So I’ve rounded up a few cute skirts I thought you might love too. If the holidays are feeling overwhelming, I’m here to help! I didn’t want to give you a thousand gift ideas, so here are 5 really good ones instead.